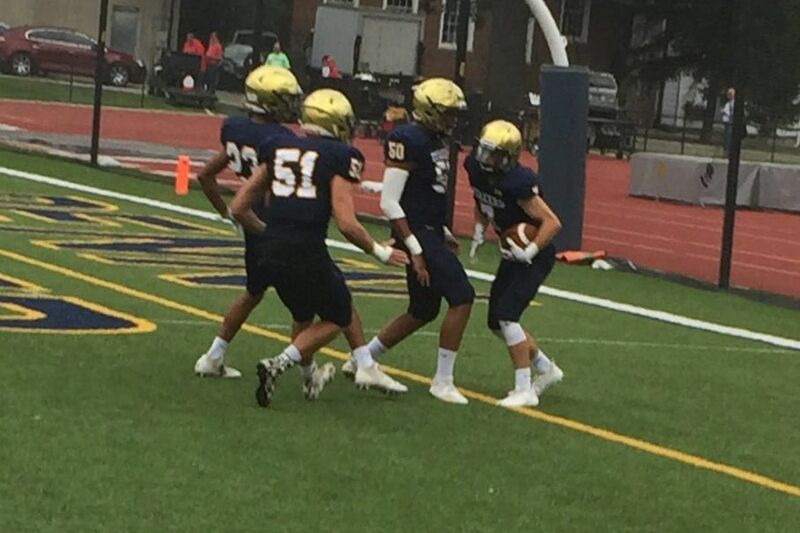 The Penn Charter football team rolled past Upper Dublin, 42-17, on Friday. Shamar Edwards' 7-yard touchdown run with over two minutes remaining locked up North Penn's 31-21 win over Central Bucks East. The Knights used up nearly eight minutes on the game-clinching drive that covered 93 yards. North Penn (5-0) plays Council Rock South next week. Malvern Prep held off Berks Catholic, 42-32, to remain unbeaten. Lonnie White's 74-yard touchdown catch early in the third quarter proved to be a key play for the Friars (4-0). Jack Fallon caught a touchdown pass and ran for a score in Central Bucks West's 35-14 triumph over William Tennent. The Bucks set the tone early with a fumble recovery in the end zone. Kareem McAdams had four touchdowns on the ground as Upper Darby ran past Strath Haven, 41-28. Ricky Ortega threw four touchdown passes in Coatesville's 55-14 rout of West Chester Henderson. The Red Raiders (5-0) have outscored their opponents by a 238-53 margin. Keed Kpoto ran for two touchdowns in Cardinal O'Hara's 21-7 victory over Archbishop Carroll. Kpoto opened the contest with a 73-yard score. Brett Barber made a pair of field goals to help Springfield (Delco) beat Marple Newtown, 26-7. Springfield's Jeff Biancaniello opened the scoring with a fumble return for a touchdown. Ben Konah followed with a score on the ground and Barber added two field goals to make it 19-0. Edward Saydee ran for over 200 yards and four touchdowns as Penn Charter rolled past Upper Dublin, 42-17. Aaron Maione started the game with a 92-yard kickoff return and Saydee capped the scoring with a 66-yard run.